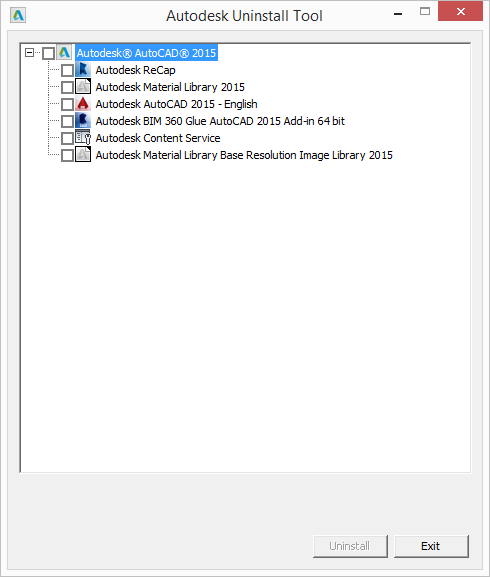 Uninstalling AutoCAD, or any Autodesk product, is cumbersome. There are multiple files, folders, applications, and packages that have to be removed to fully uninstall it. It is easy to miss something. Sometimes you even have to mess with the Windows registry to get everything. Here is a video I created for Autodesk that covers a full uninstall of AutoCAD. This video covers removing peripherals, material libraries & products. It also looks at repairing products. The video is just under five minutes long. As you can see that is a lot of work. Autodesk has created the Uninstall Tool for Autodesk products since their 2012 releases. AutoCAD 2014 and later automatically come with it. If you don't have it go to autodesk.com and find it for your product release. If you have it, it should be found in the Windows Start Menu. If you can't find it perform a search for UNINSTALL TOOL and it will show up. To uninstall a product select the box next to its name. In this example select the box next to Autodesk AutoCAD 2015.You can uninstall specific components by selecting the box next to their names instead. Once selected, click the UNINSTALL button at the bottom of the window. There will be an animation next to each component as it is being uninstalled. The animations will stop once everything is removed. Click the EXIT button when finished. Open the Uninstall Tool again to make sure everything was removed. It will only display what is left. This method is much easier than the one in the video! Keep in mind though that the Uninstall tool does not uninstall everything if you have installed a Design Suite. It will help you out whn uninstalling your products. Here are some links to some of the older Uninstall Tools and methods.